Sui Jianguo, is a contemporary Chinese artist, born in China in city of Qingdao in 1956. His parents were factory workers, largely absent during his early childhood, because of the workload that Mao’s government imposed on them. When Sui was at the age of ten, schools were closed as a part of the Cultural Revolution, and he was given a job of working in a factory with his parents. In an interview regarding this subject, he said that he was “transfixed in the age of Mao worship, when Mao was virtually a God at home”. Sui broke his arm at the age of eighteen, and he was not able to work at the factory, which gave him the opportunity to start painting. Soon, he started to study painting at night, with permission and guidance of his father. In those years, realism was the approved art style, which had a role of portraying Maoist ideals in a romantic positive light. When he returned to the factory, he started painting propaganda posters of Mao. After the death of Mao, he completed studies of a traditional Chinese landscape painting in 1976. Later, Sui moved to Jinan and then Shandong where he studied with major in sculpture. Few years later he got his master’s degree in Arts at the central Academy of Fine Arts in Beijing. He said that his inspiration for making sculptures came from the time he was working in a factory, where people used to tell him he had “skill in using his hands”. Beside traveling and displaying his art around the world, he also worked as a as a guest professor or speaker at several universities outside of China. When he returned home, he became a chairman of the department of Sculpture at the Central Academy of Fine Arts. Sui became internationally known for his “naturalistic sculptures” that he made out of rocks, boulders, and steel. In 1997 he got his true recognition, for his sculptures that imitate Chairmen Mao’s communist jacket. He uses this powerful image as a symbol of restriction and limitation, and suggests that none of the Chinese has truly taken off their Mao suits. His work could be said that is a good representation of the views and expressions of generation that survived Mao’s Cultural Revolution. His famous works include, Earth force, which is one of his earlier works, consisting of twenty 100kg boulders, each entangled in a web of ribbed steel, Mao’s suit, which has several representations, most of them hollow, some resembling Buddha’s suit, others almost transparent, Red Dinosaurs, of Jurassic Age series, made out of fiberglass, up to 3m tall, which have imprinted in the middle section Made in China, what relates directly to topics of China’s economy and it’s growth, Made in China series, which also revolves around the China’s new identity as a world producing power, Limited Motion series, which are steel structures such as cages and boxes, that house steel spheres, which are able to move due to an internal motor, created in order to express the feelings of “imprisonment” relating to Mao’s oppression. 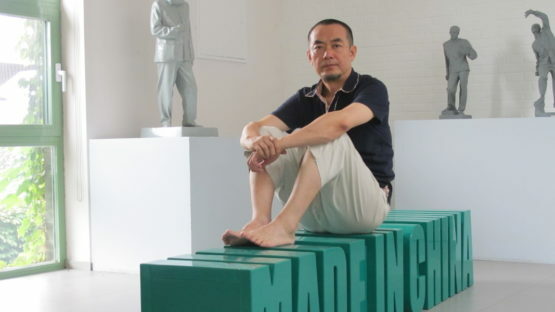 Sui Jianguo has been exhibited internationally and his works are in many notable institutional collections. He had numerous solo and joint exhibitions in Japan, Australia, Hong Kong, India, Taiwan, and the United States, in addition to his active exhibition schedule in China. His recent contribution to the Asia Society’s 2008, Art and China’s Revolution exhibition in New York comprised a ten foot tall bronze Mao jacket, which stood on a median in the middle of Park Avenue at 70th Street for nearly two months. In 2011 for his work he received Martell’s Artist of the Year award. Sui is currently a professor at the Department of Sculpture in Central Academy of Fine Arts in Beijing.